Ordinarily, I’m cooking for one, but since my brother started working local to me I now have a guaranteed dinner companion/food guinea pig once a week to share all these new recipes I plan on trying this coming year. Huzzah! Also, he provides me with a good excuse to go to my favorite ice cream shop once a week, Max’s Ice Cream, Glover Park, Washington DC, a must visit if you are in DC. Message to Max: Come back from vacation!!!! I don’t care if it is 20 degrees outside! I want ice cream!! So originally I picked this recipe out of the February Woman’s Day Magazine because it was a slow cooker recipe. I love my slow cooker and I will spare you for now my lengthy rambling about why I love it and save that for a time when I actually use my slow cooker, because I didn’t use it this time. Say what?! I know, I know who picks a slower cooker recipe for that purpose and then coverts it back? Well, me. A slow cooker recipe requires that you actually have the ingredients the morning/afternoon before the evening you want to eat the meal and the place where grocery shopping fit in that day’s agenda did not allow for it. So I went ahead and did what I usually do and made tweaks, such as DIY Tomato Sauce. If you want the original recipe click the link above. 1) Preheat oven to 350 degrees Fahrenheit. Line baking pan with foil (this just makes for easy clean up you don’t really need to do this). I recommend you start the quinoa now as well. Slice off the top 1/2 inch of peppers; seed them and reserve tops. 2) In a bowl mix tomato sauce, balsalmic vinegar, cumin and cinnamon. 3) In a skillet add ground chicken, zucchini, and onion. Season with a bit of pepper and salt. Cook chicken through. Add raisins. Mix with prepared tomato sauce, reserve some of the sauce to put on top of the stuffing. 4) Scoop into pepper shells. Cover with the reserved sauce. Cover pan with foil. Bake for 45 minutes. Uncover, sprinkle with cheese and bake for 15 minutes more or until cheese is melted. And that is it! So instead of 5-6 hours it only takes 1 1/2 hours, granted a little bit more effort needs to be made by you the cook. I served this with a salad and egg noodles and it was delicious! Enjoy! Okay, so this basic tomato sauce makes more than you really need for the recipe, but you can always freeze what you don’t use or save it for a bit for when you are making spaghetti or pizza later in the week 🙂 I love the taste of homemade sauce because it changes every time you make it and everything just tastes richer and fresh. So if you have the time and inspiration make your own sauce, it’s totally worth it. Enjoy! Over medium heat cook onion and carrots in oil until soft. I put a lid on and let it sit for like 15 minutes. Add garlic cook for about 30 seconds. Add can of tomatoes, do not drain. Stir in whole can of tomato paste. Shake on seasonings to your desired taste, just toss in the bay leaf (This is where the uniqueness of your sauce comes in so have a blast trying different herbs and seasonings.) Give it a good stir. So as promised I have the complimentary salad to the yummy guacamole sandwich. Now I know some people think that quinoa is a carbohydrate because it is so often used to substitute rice or couscous or pasta, you get the picture. Anywho…the amazing thing about quinoa is it’s a complete protein!!! So instead of having rice with your Mexican every time why not try out this great variation. It's a party in your mouth! Mix lime juice, lime zest, olive oil, and salt and pepper in a large bowl. 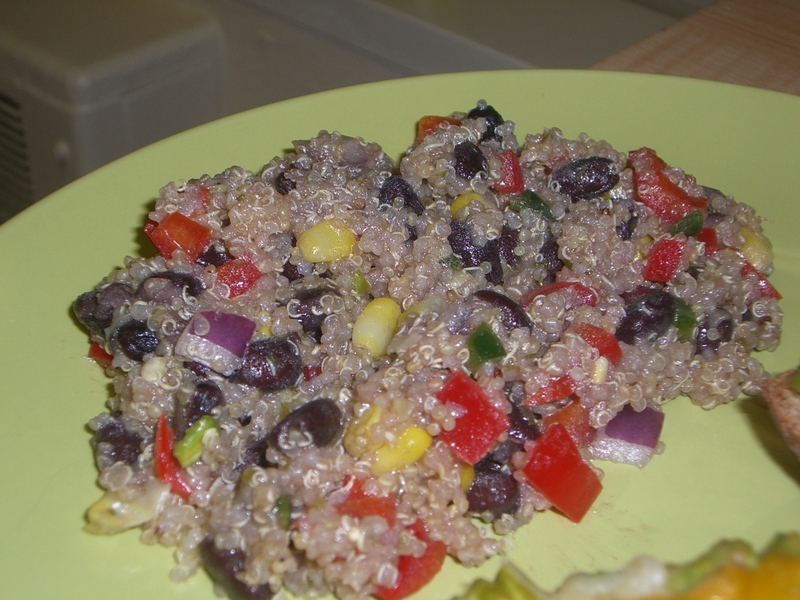 Add the chopped vegetables, corn, black beans, and quinoa to the bowl with the dressing. Stir together. Eat immediately or let the flavors settle into the quinoa. It’s that simple! I find this salad works great as a meal with tortilla chips to scoop or you can wrap it up in a burrito with some lettuce and cheese, remember it’s a protein so you are getting a very filling meal! Enjoy!